Amelia Pedlow, Rachel Pickup & Kaliswa Brewster in Intelligence. Photo by Hunter Canning. BOTTOM LINE: A new drama about women crafting American foreign policy never gets off the ground. In a windowless conference room at the State Department, we hear about Sarah MacIntyre. She’s a bit of a celebrity, a presidential appointee—we learn this before she arrive, from Lee (Kaliswa Brewster) and Paige (Amelia Pedlow), the junior staffers recruited to help Sarah on a special project. While they’re still alone, Lee confesses she loves how Sarah “pushes a room.” Paige calls her presence a “performance.” They mention the concern about being stigmatized for working with Sarah. Sarah enters (played with a sophisticated and commanding presence by Rachel Pickup), and she certainly owns the room. She has a big personality, and immediately expects a lot of these women. She tells them quickly that they’ll be writing guidelines for conflict resolution in the Foreign Service. And that she hand-picked them herself. Sarah has them introduce themselves; they all describe themselves as American, and that’s about as much as we get to learn about these women. We can see from the way they’re dressed (costumes by Sophia Choi) that Paige is little nerdy, Lee is a little more glam. But we don’t get to know much about their personalities, or their pasts, or their likes or dislikes. We just know they work at the Department of State, and in this room with Sarah. Within minutes, Sarah introduces her signature method of training diplomats: role-playing foreign conflicts. Yet we never quite know who they are role-playing as, or what the situation is. Sarah’s methods are unconventional, we are told. Working for her is maybe a little controversial, we gather. And granted, having three women in a room working on a project at the State Department is progressive—wonderfully so. But in an environment so rich with conflict and foreign policy, Helen Banner’s play tells us nearly nothing about foreign policy. Who are these men they must practice dealing with? Which leaders? What country? Why? With role-play after role-play, it feels more like Sarah is teaching a drama class, rather than training young diplomats. And by never naming conflicts, or delving into anything specific, the actual story of Intelligence is unclear. Is it a story about Sarah MacInytre? We don’t really know that much about her. Is it about Paige and Lee? We learn even less about them. Later in the play, Banner touches on the violence experienced by people working in the foreign service. But Paige can’t handle talk of violence, so even this thread remains relatively unexplored. 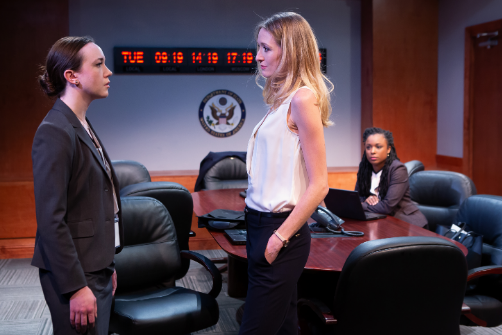 Directed by Jess Chayes, Intelligence is well staged, and crafted to create tension in the conference room designed by Carolyn Mraz—tension between the actresses, and between the audience. We feel like we are in this awkward situation, in this small conference room, with these characters. Despite the vague plot, the acting is excellent. Each of the three women brings a unique presence and they play off each other well, with the necessary chemistry to create the requisite tension. A few veiled references are made to the current presidential administration—mass staff departures and "America first," among others. But Banner’s point of view is unclear. What exactly is the message of this play? What is her actual perspective on diplomacy? Is our country going in the wrong direction? After 100 minutes of Intelligence, I’m still not sure. Intelligence is by Helen Banner. Directed by Jess Chayes. Set Design by Carolyn Mraz. Lighting and Projection Design by Jeanette Oi-Suk Yew. Sound Design and Original Music by Sinan Refik Zafar. Props Designer is Jess Cummings. Production Stage Manager is Allison Raynes. The cast is Kaliswa Brewster, Amelia Pedlow, and Rachel Pickup.